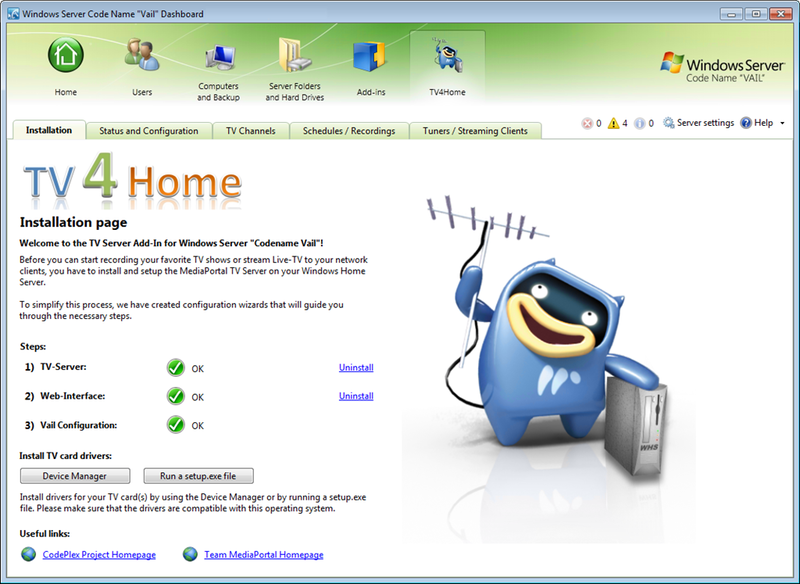 TV4Home is a new add-in which installs the MediaPortal TV Server onto Windows Home Server, adding better support for TV tuner cards in both WHS v1 and WHS2011. 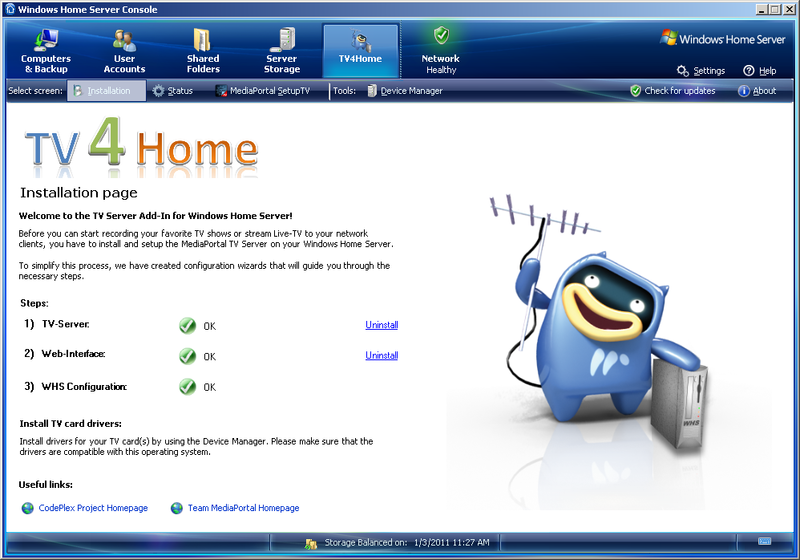 Using easy to use wizards the add-in allows you to record your favorite TV shows or stream Live-TV to your network clients and it properly integrates into the Home Server Console/Dashboard to provide an overview of the current TV Server status. 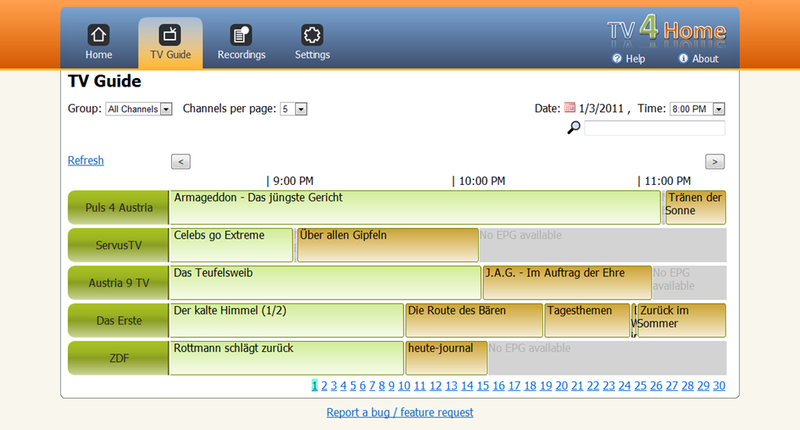 TV4Home also provides a web interface with single sign on using the WHS Remote Access Website so you can schedule recordings by using the EPG (Electronic Program Guide) from any Internet-connected PC by simply visiting your WHS Remote Access Website and clicking on the TV4Home link. Whilst in theory every TV card supported by MediaPortal TV Server (see here) should work, there may be some incompatibilities between the cards and WHS. Especially Windows Home Server v1 which might have some problems that WHS2011 doesn’t have, since it is more optimized for media scenarios. There is therefore a list of cards that are known to work with WHSv1 or WHS "Vail" which you can view here. If you have tested a TV card that works with WHS but is not listed here, please let the developer know via their Discussions page. The downloads for both WHS v1 and WHS2011 as well as the necessary documentation can be found here.